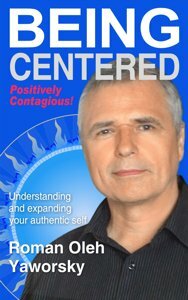 Being Centered has been called a combination of a Spiritual Coach and the best Life Coach you can buy in a book! This is a book that takes a very different perspective in revealing the process of healing and the journey of transformation. It asks the basic questions: How did we lose our authentic self? And how do we get it back? In a series of revealing and penetrating chapters, Roman Oleh Yaworsky traces how we give away our uniqueness, our joy and our power. Being Centered sheds new light on how we interact, both inwardly and outwardly, how we tend to get stuck, and the means to help us return to our true nature, to who we really are. We really are meant to be in joy and in our hearts. We really are meant to share that joy and heart with others, and when we are free to do so, that joy is contagious! This book is both practical and comprehensive. Each main chapter includes not only detailed and practical examples, but the clear directions and steps that we can apply in our everyday lives to take us back to our center, towards trust in who we are meant to be. Each succeeding chapter shows a different path, a different approach back to our truer nature. Being Centered is for everyone going through changes and shifts, a must have book if you need to know how to go where you are going, with greater ease! This book is a blue print for reclaiming our lives. Being Centered is also available as a Kindle e-book on Amazon. "This is the BEST book on self healing I have ever come across! " "It should be on everybody's desk." "It explained things no other book has ever touched on." "Fantastic book! Thank you. Thank you. Thank you!" ". . .we need to wake up to our experience of life through our hearts, soul and spirit. This book is a journey towards that heart. It is a journey I have taken and it is a journey that I now share. It is a journey towards being centered."